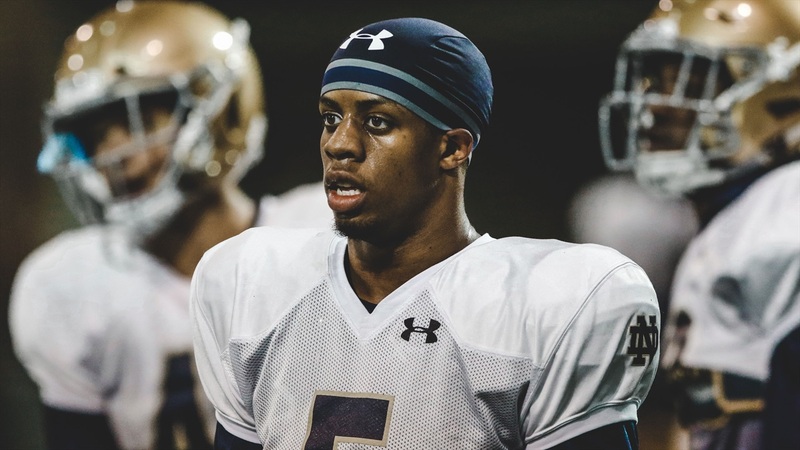 There is zero debate around Notre Dame that the cornerback room is now under the leadership of Troy Pride Jr. The 5-foot-11, 194-pounder is coming off a breakout 2018 season and it’s on him to help lead the youth at cornerback. The Greer (S.C.) native has also seen younger players at linebacker start to step up over the first few weeks of spring ball. Pride established himself last fall, but he will have to perform at a higher level on Saturday’s to earn and keep the respect as one of the leaders on Clark Lea’s defense. With one year left, it might be easier to focus on his own game, but that’s not Troy Pride Jr. Pride has taken Avery Davis under his wing this spring as the former quarterback/running back makes the transition to cornerback. “AD is a fluid athlete,” Pride said. “Moving to corner, he’s already picking it up. He’s very physical. I saw him jam someone almost to the sideline. We have to continue to work those little things at corner. Once he hits the ground running, the sky is the limit for him because he’s built solid and he can move well. The increased leadership doesn’t end with Davis. Pride is making sure his cornerback room shows growth each practice and it starts with embracing competition. Embracing competition is something Pride has always shown at Notre Dame, but it’s at the forefront more than ever as he battles with senior receiver Chase Claypool every day. During Tuesday’s practice, Pride had phenomenal coverage on Claypool, but the 6-foot-5 receiver went up and made incredible plays few players can make in college football. Pride wasn’t pleased with the balls that were caught on him, so he stayed after practice to work on a few things on Tuesday. Speaking of being a competitor, Pride is one of the few student-athletes at Notre Dame who have played two sports. Pride debated running track this spring after running his first two seasons, but decided to focus on football. However, Pride managed to sneak in the 2019 Alex Wilson Invitational in February. He finished in second place in the 60m with a 6.8 with just three days of practice. Pride admitted his body felt a little different this spring after not running track full-time along with spring ball, which could be to Notre Dame’s benefit in the fall.